As you can figure out by now and as I've said before, I walked into Meijer one day and made a massive protein bar purchase. This was before the thought of this blog ever crossed my mind, so I was just purchasing these babies for their actual nutritional effect. So, I purchased every single variety so I wouldn't get bored and that led me to this Pure Protein Peanut Butter Caramel Surprise Bar for $1.29. According to Pure Protein's website, the surprise is the caramel filling, so let's see how surprising it really was. 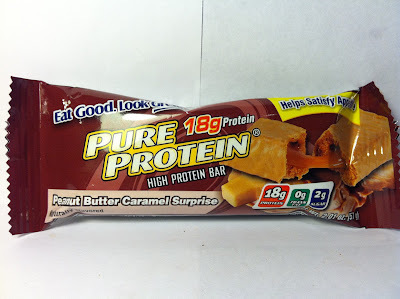 This one's got 210 calories and eighteen grams of protein and as you can see on the wrapper and in the picture, this one is a bar made of a "cake-y" material with a caramel center surrounded in an outer coating, which judging by its color (and the name of the product) is intended to be peanut butter flavored. You can see it's all there and frankly I was surprised by the caramel filling. I was expecting something hard, calcified and nasty, but this one was fairly gooey. If I had to compare it to something, I would say toothpaste and/or a soft taffy. It's not often that you can take a comparison to toothpaste as a compliment, but in this case, I would say that is sort of a compliment. Weird. The flavor of the caramel center was quite surprising as well since it really did taste like caramel and combined with the soft taffy-like texture, it was actually moderately pleasant. Wow, this thing was giving me a pleasant surprise so far. Unfortunately, the pleasantries ended there. The cake-y layer was not nearly as solid and gummy as most of these protein bars, but instead of a gummy taste, it felt like very gritty and sandy. I remember eating sand as a kid and there's a reason I stopped eating it: it was awful. The cake-y layer in this is the same. As for the peanut butter coating, I can say it had a strong peanut butter flavor at first taste, but once you left it in your mouth while chewing, it developed a strange, almost acidic aftertaste. Definitely not appealing. Buy It or Fly By It? Definitely FLY BY IT. After a positive start, this whole bar went downhill quickly and actually repulsed me a bit. 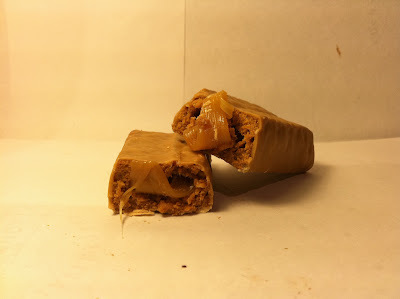 I love, love, love peanut butter, but not even the peanut butter flavoring (prior to the acidic taste) and the surprising caramel could save this one. If you see this one in the aisle, turn away because it is just plain weird.